"A Lifetime of Experience on Lake Lanier"
Shane Watson is a 3rd generation Lake Lanier fisherman. He has fished Lake Lanier for over 40 years. Shane's Grandpa and his uncles all fished Lake Lanier through the late 50's, 60's, 70's, and 80's. Lake Lanier fishing is Shane's heritage. Shane’s family has lived a few miles from Lake Lanier for over 100 years. They were there for the Buford Dam ground breaking ceremony in 1950, they watched the flood gates close in 1956, and saw the lake full for the first time in 1959. Shane's grandparents said this was such an exciting time for the residents of North Georgia as it brought prosperity and electricity to many people. Since 1979, Shane Watson has devoted his life to perfecting the skills and techniques needed to consistently catch fresh water stripers. Many of Shane's live bait and trolling methods are used by professional fisherman and weekend anglers across the country. 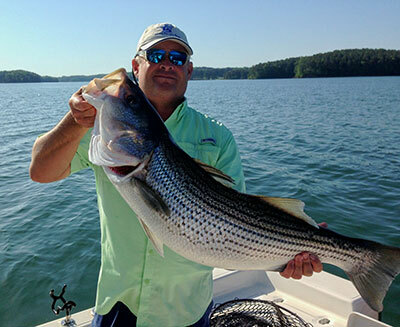 Shane Watson is the founder of the Lake Lanier Light Tackle Guide Association. He has been featured on CBS, FOX, ESPN, TNN, The Outdoor Channel, and Sports South. Shane provides the fishing reports for Hammond’s Fishing Center, Lake Lanier.com, Georgia Outdoor News, The Lake Lanier Association, Cyber Angler, and many other media outlets across the internet. 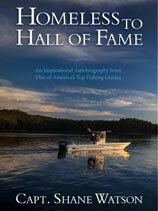 In January 2010, Shane Watson was inducted into “The Freshwater Fishing Hall of Fame” as a Legendary Guide. Shane Watson runs Lake Lanier’s "Only" Full-Time Fishing Fleet, with 7 guide boats open year round. Shane and his guides have over 150 years combined Lake Lanier experience. They are all very knowledgeable and will be glad to share information and answer any fishing questions you may have. Shane Watson Guide Service is a family owned and operated business. Shane’s wife Pam handles the scheduling and the books for all the boats. Pam is an absolute pleasure to do business with. All Shane Watson Guide Service boats remain in constant radio and cell phone contact, which gives them up to the minute information and increased coverage of the lake. When you fish with Shane Watson Guide Service, you get the strength, coverage, and experience of the entire Fleet. Shane Watson Guide Service is open year round, 7 days a week.